I'm not even going to pretend to be unbiased when it comes to Lucy Knisley's work. I am so freaking biased. I love just about everything she does. 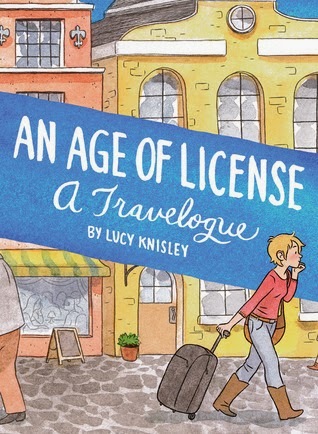 An Age of License is a travelogue about her time roughly 2-3 years ago as she traveled across Europe after a break up. She was the featured speaker at a Norwegian comics convention, she met up with her lover in Sweden, crashed some friends' honeymoon, visited Paris, and finally met up with her mom and some of her friends in another part of France. This book was really about "finding yourself" more than any of Knisley's other books have been. At a decidedly uncertain time in her life, she had an opportunity to free-wheel across the world and work through some of her insecurities in relationships and her profession. Of Knisley's body of work, this book is not my favorite. In fact, it might be my least favorite. But by my estimation, a less than perfect Knisley book is still pretty darn good. I always love her illustrative style, but the period of her life she was grappling with in this book was less relatable for me than her other work. There's a candidness to this book that really took me back to my own "age of license" in my mid-20s when everything seemed big, choices were nearly overwhelming, and I was not yet secure enough to not be neurotic about it. I don't miss that phase! On the gripier side, the publisher of this book is different from her previous two. While Fantagraphics has provided a well-made book, hefty in the hands and significant, I also found it stiff and a beast to hold at times. I finally gave up about halfway through and "cracked" the spine. No serious damage done, but a small crease nonetheless. I wish this one was as pleasant to hold as Relish, and I do miss full-color, though who's to say if that was Knisley's choice or the publisher's. If you're as big a Knisley fan as I am, I think you'll want to read this one. If you're on the fence, pick up Relish or her newest travelogue, Displacement, ASAP! If I recall correctly, she has ANOTHER new book coming out later this year or next about her wedding. So many good things from Lucy Knisley. This sounds good. I have never read this author. She's so good, Sheila! I hope you'll give Relish a try. It's so fun. Lucy Knisley rocks my socks. I loved this book but would have liked more color. I do think Relish is my favorite Knisley book. I think it was nice to run across a page of colored illustration from time to time, but I definitely like more on the whole. LOL, they come up so fast! She's prolific, for sure. Great point. It definitely felt less tight...less cohesive. I thumbed through Relish earlier last year and need to take time to sit down and read the whole thing. You've been such a great cheerleader for this author and I'm eager to try Displacement, as well. Yes! I think you'd love it, Les! Great stories, great food. I am about to join the Lucy Kinsley fan club. I have Relish sitting on my shelf and I am very excited! Yay! I hope you loooooove it! I haven't read anything by Kinsley yet, but her illustrations look very cute! "There's a candidness to this book that really took me back to my own "age of license" in my mid-20s when everything seemed big, choices were nearly overwhelming, and I was not yet secure enough to not be neurotic about it. I don't miss that phase!" SO glad to hear it ends!